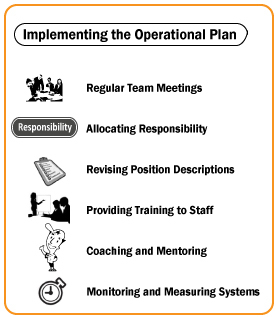 The Operational Plan is a basic tool that directs the day-to-day activities of organisational staff. All staff should be aware of the existence of the operational plan, what its purpose is and why it is important to them. The Operational Plan is only as good as the diligence of staff in putting it into action. To ensure that there is sufficient understanding of the operational plan, the highest echelons of management within the organisation must thoroughly communicate the operational plan to staff. A series of staff / team meetings in which senior management are engaged in explaining key aspects of the operational plan and dealing with questions that staff raise about the plan. A breakdown of the overall operational plan into subsets and communication of each subset to the work team or section that takes responsibility. This enables the work team to more clearly understand, and be focused on, their part in implementing the whole plan. The development of systems that enable progress of strategies / tasks to be measured and reported within a work team, and to management. The provision of training so that staff may better understand their tasks and responsibilities, and especially how they can contribute to the overall achievement of the operational plan. The implementation of the Operational Plan requires management to regularly monitor achievement and exert control to reduce any variance from the plan.